Angler's come to Mammoth Lake's for a chance to bag rainbow, brown, brook, and cutthroat trout. Favorite spots include Lake Mamie, Twin Lakes, Lake Mary, and Lake George. Located on Lake Mary in California. Fishing opportunities, boat rentals, fishing licenses available, general store with fishing supplies, and more activities located nearby. For your best chance at a large brown or Alpers trout, head to Lake Mamie. A favorite with shore fishermen, Lake George's shoreline is almost entirely accesible by foot. Boat fishermen enjoy Twin Lake's abundant waters. A favorite spot is the base of Twin Falls. Angler's come to Mammoth Lake's for a chance to bag rainbow, brown, cutthroat, brook, and Alper's Trout at one of the many scenic alpine fisheries. Trout fishing season begins the last Saturday in April and runs through November 15th. A few select areas with catch and release only fishing, such as Hot Creek and Owen’s River, are open year round. In the eastern Sierra’s you’ll be bagging Brown, Cutthr0at, Rainbow, and Alpers Trout. Fisherman come for the world class fishing (best from a boat or float tube) and are treated to 300 foot Twin Falls. Some of the more popular areas include fishing off the right of the footbridge across from Tamarack Lodge, as well as near the bottom of the waterfall. 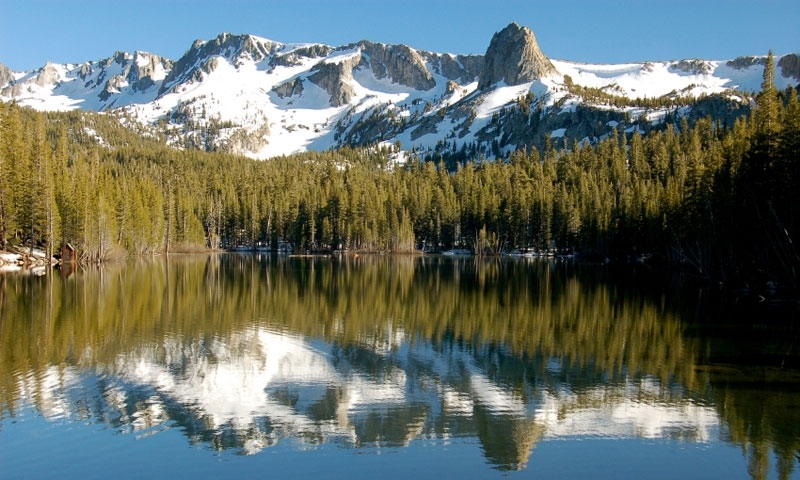 At nearly one mile long, this is the largest Lake in the Mammoth Lakes Basin. Popular fishing spots include the Lake George Inlet and the Lake Mamie inlet. If you’re looking for shore fishing, this is your best bet in the Mammoth Lakes Basin, as most of the shoreline is accessible by foot. Favorite spots include the banks around the marina, and the rocks bordering the lodge. For you’re best shot at a large Brown or Alpers Trout, this is your spot, as the Lake is stocked regularly with new stock. Try fishing right in front of the parking lot, where a large hole in the lake bed often houses large trout.